A tourist magnet and a fuel exporter, Aruba is an autonomous territory of the Netherlands. It lies off South America's Caribbean coast. Away from the beaches, hotels and casinos, much of the island is desert-like. A strong indigenous heritage, colonisation and Latin America's influence have given it a distinctive social and linguistic character. Aruba is one of the most prosperous territories in the Caribbean. A gold rush in the 1820s triggered an economic boom and mining went on for almost a century until reserves were exhausted. In the 1920s a petroleum refinery was opened at the port of San Nicolaas. The money generated by the refinery raised living standards, but its temporary closure in 1985 - amid a global petroleum glut - sparked an economic crisis. 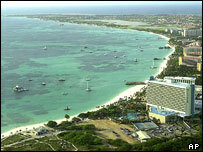 Aruba has since invested in tourism, which has become its economic mainstay. Lying close to the South American mainland, Aruba is susceptible to drug smuggling and illegal immigration. The territory has passed laws to combat money-laundering. Independence has been widely debated, and the idea was endorsed by voters in 1977. In 1986 Aruba pulled out of the Netherlands Antilles - a federation of Dutch Caribbean territories - and obtained separate status within the Kingdom of the Netherlands. Plans for full independence by 1996 were shelved at a meeting in The Hague in 1994. The Dutch government controls defence and foreign affairs and the island's government handles local matters. Colonised by the Dutch in the 17th century, Aruba was controlled by the British for a short time during the Napoleonic Wars. Status: Autonomous member of the Netherlands. Dutch government is responsible for defence and foreign affairs. Mike Eman was sworn in as prime minister in October 2009, following the parliamentary election win by his Aruba People's Party. The Aruba People's Party defeated the People's Electoral Movement, led by Nelson Orlando Oduber, who had been prime minister since 2001.